Click on the image above to apply now. Kenny's Floor Covering Credit: Issued by Wells Fargo Bank, the issuer of Shaw Industries, Inc. credit card. Your Kenny's Floor Covering Shaw Credit card can be used to purchase any brand of floor covering, it does not have to be a Shaw product. 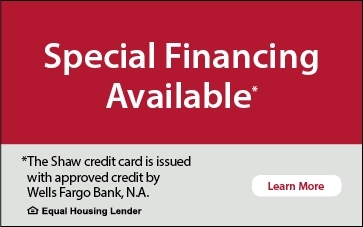 You can literally use your line of credit to purchase anything in the store at Kenny's Floor Covering. The quick and easy way to purchase all your floor covering and decorating products. Use your Kenny's Shaw store credit card as a household financial management tool that will get you exactly what you want when you want it and free up cash and your regular credit for other family needs and emergencies. Use the Kenny's Shaw Credit Card to avoid tying up your other major credit cards. Apply right now on-line for the Shaw Consumer Credit Card or visit Kenny's Floor Covering your Authorized Shaw Retailer.